Netflix’s BoJack Horseman, which premieres its fifth season on Friday, has gotten so confident that it tosses off jokes other shows would milk to death. Among many other gags throughout the season, I’m thinking of a silent, background scene in a restaurant, in which an anthropomorphized sow on the left side of the frame dines alone and in great distress, while diners on the right feast on the head of a roast suckling pig. So much is unstated here. Did these pigs know each other? Is it the general idea of carnivorousness that’s upsetting her? Meat eaters and plant eaters coexist in this world, along with omnivorous humans, but what are the rules of protocol? Raphael Bob-Waksberg’s animated comedy-in-theory doesn’t explain too much, except when its hypertalkative showbiz and showbiz-adjacent characters are trying to explain themselves. Then they talk themselves horse, er, hoarse, while only sometimes confronting the delusions that make life harder. In the season’s big centerpiece — sort of a companion to the season-three episode where BoJack visits an underwater film festival, which is told partly as a silent movie with muffled bubbly bursts in place of comprehensible English — BoJack delivers a 20-minute funeral eulogy, really more of an alternately hilarious and agonizing monologue, while standing next to a coffin. This visually arresting series becomes an illustrated stage production for a while, and amazingly, it works. (There hasn’t been a TV episode like this since the Harriet Tubman showstopper on WGN’s gone-too-soon slavery drama Underground.) It’s a terrific working-through of grief, particularly survivors’ realizations that they’re never going to get closure on all the issues that gnawed at the relationship between themselves and the deceased back when they were both alive and could’ve talked to each other. Sans context, though, it’s hard to know how literally we’re supposed to take any of it. Is BoJack actually, physically present at the funeral? Is he imagining being there? (Alcoholics are just as likely to miss these sorts of events as attend them.) He occasionally cues a snare drum as if he’s an old-fashioned stand-up comic, and long stretches of his eulogy feel as “written” as a short story. Is he really working through anything, is it just more verbal masturbation from a character who has absorbed the language of therapy but tends to stop short of actually learning and changing as a result? Either way, it’s all part of the larger, Mad Men–styled disconnect between intelligence and wisdom that BoJack portrays so well. The ties between the series are numerous and multifaceted, but two stand out. One is the idea of BoJack, a charismatic but self-destructive and selfish character, seeming to fall through life much like the silhouetted man (probably Don Draper) in Mad Men’s credits: BoJack “falls” horizontally rather than vertically, floating out of his bed and through his room, past signifiers of his privileged life and the showbiz world, then drifting backward off the balcony only to end up at the bottom of a swimming pool — a death/suicide image, like the falling figure in the Mad Men credits — and then right back where he started, having perhaps just fantasized or dreamed the preceding imagery. Both shows, like The Sopranos before them, also get at the seemingly unending cycles of disaster, catharsis, self-knowledge, and forgetting that we travel through as we age. BoJack seems to know himself better now, partly as a result of having repeatedly screwed up so badly. But this season more than ever, we get the sense that the talking and proclaiming and self-analysis has become a substitute for meaningful action, just a more elaborate set of lies that he can tell himself. It’s also a bulwark against further disappointments, of which daily life offers plenty. As Tony Soprano memorably put it, they say every day is a gift, but does it have to be a pair of socks? More impressive than season five’s BoJack-centric story lines are the stand-alone episodes devoted to supporting players. In one, Mr. Peanutbutter (Paul F. Tompkins) is struggling to accept the end of his marriage to Diane Nguyen and getting into a new relationship. In another, the cultural whiteness of Diane — a Vietnamese-American character who is problematically voiced by Alison Brie — is folded into a Vietnam-set story that’s structured as entries in a bullet-pointed article she’s writing. It’s a nifty workaround to a problem that Bob-Waksburg discussed with Slate’s Inkoo Kang: A character who was cast rather unthinkingly five seasons ago has been smartly retro-engineered as a woman disconnected from her cultural roots. When Diane visits her family’s ancestral homeland, she feels as if she exists both inside and outside of it. She’s a tourist who, in one mortifying scene, is mistaken for a native by white tourists; the patriarch talks to her in broken English, and she responds in kind. Elsewhere, the asexuality of Todd Chavez (Aaron Paul) gets explored in more detail, particularly in an episode where he and his girlfriend, an axolotl named Yolanda Buenaventura (Natalie Morales), go home to meet her mother, father, and sister (Abbi Jacobson), all of whom are ostentatiously sexual and expect Yolanda to behave the same way. BoJack even builds an episode around the therapist Indira (Issa Rae), who has loose lips about the celebrities she’s treating (or hears about secondhand) and banters about them over lunch with her corporate mediator wife (Wanda Sykes), who knows many of the other major characters and is just as bad about disguising their identity in anecdotes. 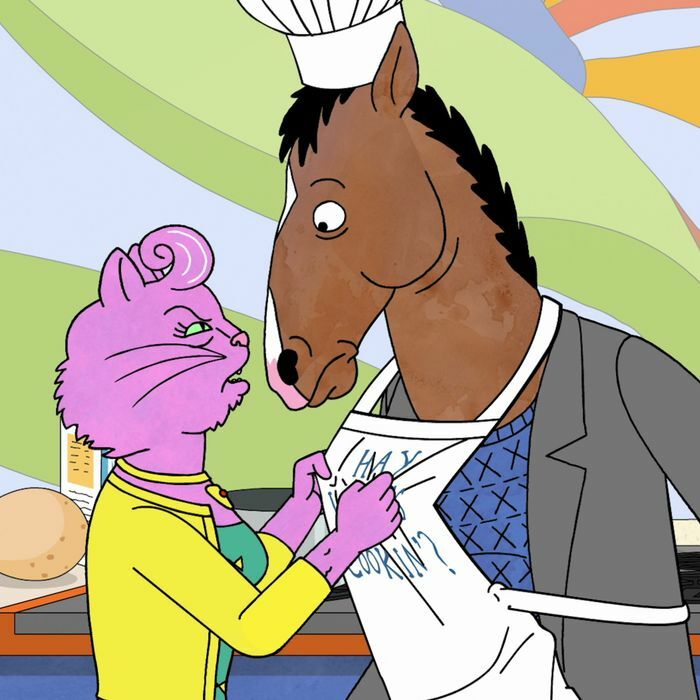 It’s a great way to deepen the show’s roster of players while still carrying the story forward in surprising, at times hilarious ways: BoJack’s agent turned producer, Princess Caroline (Amy Sedaris), is represented as a translucent fog-shaped creature, while Todd has a gigantic hand for a head. Five seasons in, it’s still hard to know what to tell people when they ask what this show is about. It’s about a lot of things, clearly, including the impossibility of answering those sorts of questions about popular art when the people who make it are following their own peculiar muse. BoJack and the rest are just muddling through as best they can, trying to make sense of life before it ends, knowing it’ll probably never happen and that we’re all trapped in our imaginations and emotions to some extent, but that it’s still possible to try to be good to each other.